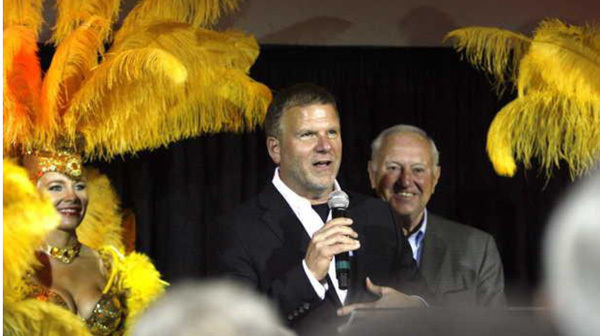 BILOXI -- The speeches were short and then the party was on Friday when Landry's Chairman Tilman Fertitta and Biloxi Mayor A.J. Holloway cut the ribbon on the re-branded Golden Nugget Casino. General Manager Jim Hoskins said crews had worked through the night to prepare for the opening. Just over a week ago, the area inside the entrance was stripped down to concrete. "Now look at it," Hoskins said. The view and music extended from the entrance into RUSH Lounge and Party Pit and beyond that into Lillie's Asian Cuisine. A balcony in the lounge at Morton's Steakhouse overlooked the action. Friday's opening was a production. The Storyville Stompers second-liner band led the way into the new casino area, the Golden Nugget Showgirls in towering headdresses welcomed customers and the NASCAR girls hovered near Kevin Harvick's car. "We don't have these events very often anymore," said Larry Gregory, director of the Mississippi Casino Operators Association. People were lined up more than an hour ahead of the ribbon-cutting to be part of the spectacle. Gregory said the Golden Nugget's willingness to invest in Biloxi and the hotel tower under construction at Hard Rock Casino Biloxi show that in a very competitive market, Biloxi is meeting the competition head-on. Wally Carter, who serves on the Mississippi Gaming Commission, agreed. "I thing it's sending a strong signal that the Coast is back," he said. "Tilman Fertitta is making a significant investment here. He chose Biloxi." Holloway said he appreciated Fertitta's confidence in Biloxi. "These are exciting times," he said, referring to the new casino taking shape and the Waterfront Park and Seafood Museum under construction across the street. Speaking with reporters after the opening, Fertitta said the Isle Casino, which was the first to open in the South, has become the Golden Nugget in just the first phase of a $100 million renovation and expansion. "As you can see, it looks like a brand-new building," he said. The modern design and rich colors follow the style of the Golden Nugget casinos in Atlantic City, N.J., Las Vegas and Laughlin, Nev. Jeffrey Cantwell, senior vice president of development at Landry's, confirmed Fertitta was very involved in the transformation of the Biloxi property. "We painted this ceiling three times," Cantwell said. The renovation of all 700 guest rooms has begun and future phases at the Biloxi resort will bring a Bubba Gump Shrimp Co. restaurant, a new casino floor, a sports bar, showroom and an "amazing" swimming pool. Fertitta said what will make Golden Nugget Biloxi distinctive will go beyond architecture and amenities. "The best thing you have here in Biloxi are the people," he said. "The people that work here and the people that come here." He walked through the crowd after the ribbon-cutting, shaking hands with customers. As excited as he was to see their enthusiasm Friday, he said, "as phase 2 and 3 finish between now and next March, they're just going to love the place." Friday's opening drew customers from well beyond Biloxi. "As we were driving here, there were more out-of-state tags than Mississippi (tags)," said Barnett Ratcliff, who attended the opening celebration. Fertitta isn't new to Biloxi. Landry's restaurant in Biloxi was destroyed by Hurricane Katrina and Fertitta said he tried to open a casino at Point Cadet in East Biloxi before the current property became available. For Rich Westfall, who rode the Isle of Capri riverboats into Biloxi in 1992 and worked at Isle Casino for years, Friday was a bittersweet day. His son Andy Westfall is one of the project managers overseeing the renovation at the Golden Nugget for contractor Yates Construction. "They're taking everything out that we put in," Rich Westfall said. It's difficult to see what he and the other employees worked so hard to build go away, he said, but it's also exciting to see the Golden Nugget transform the property to its full potential. "I think that the Golden Nugget is going to change gaming on the Coast in a very positive way," he said. The grand opening celebration will continue through the weekend with entertainment and special NASCAR promotions that are a first for Mississippi.